Custom circle magnets are a practical and attractive way to promote your phone number, business name, brand logo and contact information. Stuck on someone’s refrigerator door and car door, these round advertising magnets will build conviction around your brand and put your number before their eyes. Use round refrigerator magnets (20 & 25 MIL) and circular car magnets (30 MIL) as a promotional gift during your next tradeshow or convention. 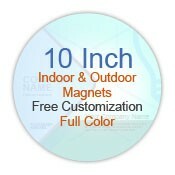 Get big savings on round custom magnets wholesale! Personalized round magnets are great if you wish to introduce your business to a new client or acknowledge your guests. Custom circle magnets are offered in sizes varying from 1.5 inches – 10+ inches. These custom magnets are produced using recycled magnetic material and possess strong magnetic backing. 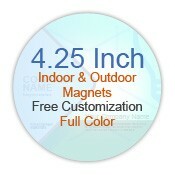 Personalized round magnets make a unique promotional gift throughout the year and they add an extra touch of elegance to branding efforts. It is a perfect way to rally across your brand name without burdening your marketing budget. People are not fond of traditional business cards and flyers. They usually do not read it or pay attention to the details on it unless it becomes necessary. However, you can inspire them to value your efforts by giving them the circular advertising magnets with your business information on it. Informative promotional magnets are retained over refrigerators or car bumpers. You can get our custom circle magnets imprinted with your logo, slogan and contact information. 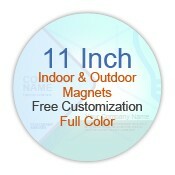 You can have the benefits of full-color printing for making your business messages stand out in the niche. 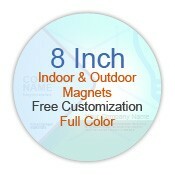 With CMYK or full color printing, marketers can easily get their brand logo and brand contact information with the colors of their choice. Perfect for imprinting sports schedule information, mini save-the-date reminders for weddings, birthdays, baby showers, anniversaries and more! Whatever be the reason, you can avail free shipping for any of these round refrigerator magnets and round custom outdoor magnets, anywhere within the Contiguous USA (except Alaska and Hawaii). To discuss promotional possibilities of these personalized round magnets for indoor and outdoor purposes, you can always give us a call at 855-762-4638 or email us at info@Cmagnets.com.